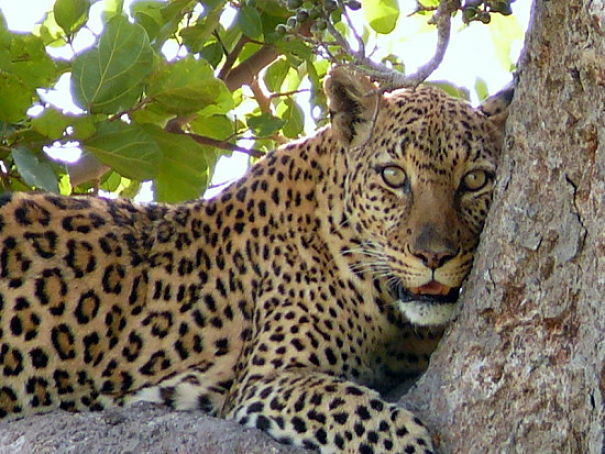 The leopard's climbing ability sets it apart from the other big cats and has made it the most successful of the group as far as its numbers in the wild. 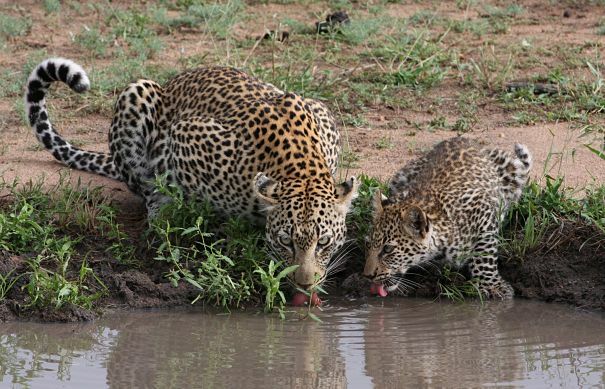 Although leopards in Asia are critically endangered, the African leopard is quite numerous and estimates are that there are close to 500,000 wild leopards in existence. 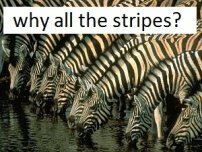 That number is nearly ten times the number of all wild lions, tigers and cheetahs combined. Their tree climbing prowess doesn't just give them the means to keep their kills safe, it also provides them a quick escape from the many animals on the African plains that can make life tough. The leopard is a gifted, swift and effective hunter, but it is less than half the size of a mature lioness, has nowhere near the pugnacious tendencies of a hyena, and wouldn't stand a chance against a pack of African wild dogs. 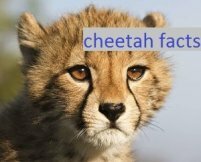 While the cheetah hunts in daylight in plain sight of any other predators that might want to steal it's prey, the leopard hunts almost exclusively by night, and it is a notoriously silent killer. One of the things that makes the rare man-eating leopard so incredibly lethal. An older or injured leopard that can no longer take wild game, may find an easier mark in a nearby African village. The leopard is a stunningly beautiful animal with a coat of buff to bright orange strewn with circles of spots called "rosettes". Sometimes their spots are actually square in shape. There is also a type of coloration known as melanism which is an increase in dark pigment of the skin and fur which occurs in about 6% of all leopards and results in what is known as a "black panther". From a distance, Black panthers appear to be solid black in color, but close up you can actually see black spots on the coat. 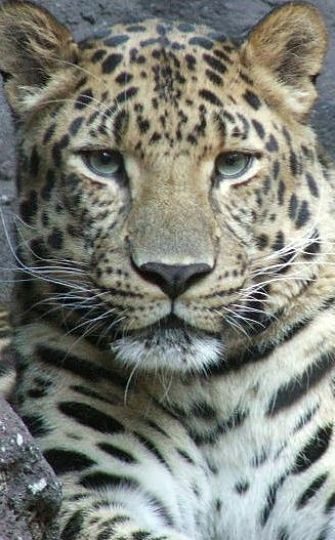 The other spotted big cat, the jaguar, is very similar in appearance to the leopard and easily mistaken for one. Jaguars are generally much larger and more bulky than leopards and have much broader, rounder heads with smaller ears and eyes. Because of their bulk, they do not share the leopards excellent climbing abilities, and so their lifestyle is more like that of a tiger than a leopard. 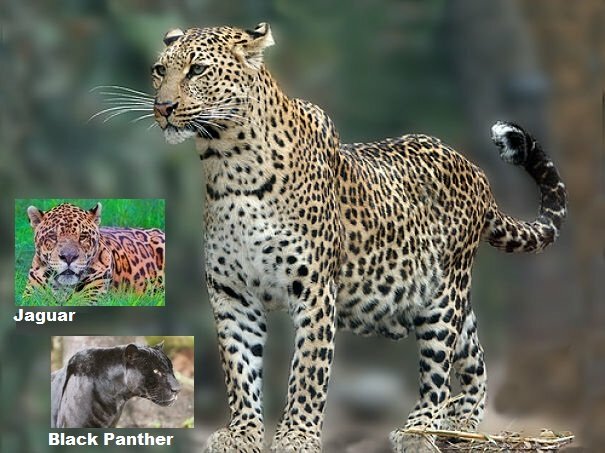 Melanism occurs in jaguars as well, at approximately the same rate as in leopards, and the term "black panther" applies to melanistic individuals of both species. Leopards are loners and live the most solitary lives of all the big cats. In fact, unless they are paired up during a few short days of mating, adult leopards are almost never seen together. 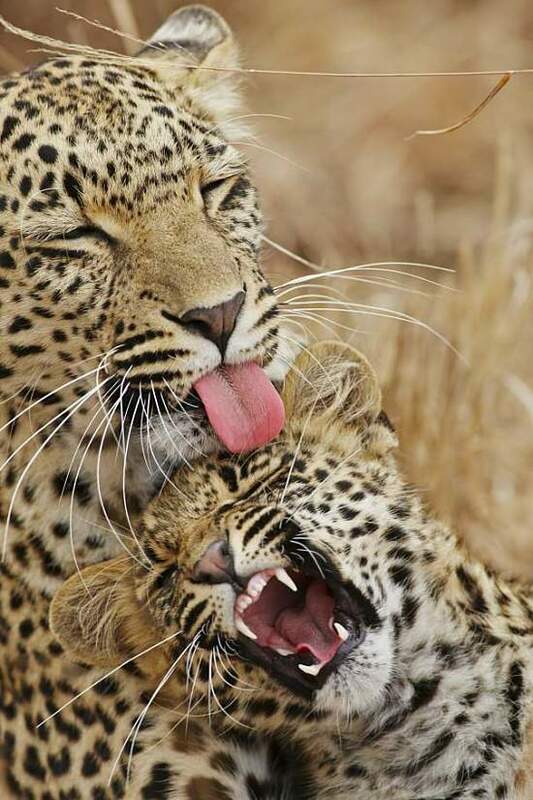 The only time leopards spend in close company is the first 1 1/2 to 2 years of life spent with mom. 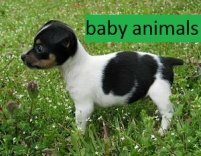 After that, and once the youngster leaves, they have no further contact with their mother, and no contact at all with their father who never hangs around after mating is over. Leopards mark their territories in the same way as many cats do, with scent marking using urine sprays and sight markings leaving deep claw marks in selected tree trunks. A male leopards territory is thought to be three times as big as the females, and will overlap or completely encompass one or more females home ranges. Even so, they will avoid each other, making husky coughing type sounds as they patrol to let others know its time to clear out. 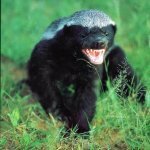 Confrontations are rare because great effort seems to be taken to have no close contact, but they will keep tabs on each other by visiting the sites that their neighbors regularly mark and scent. 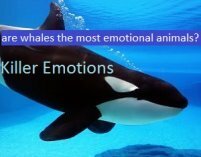 Females come into season several times a year until impregnated. When looking for a mate she makes a rowling sound similar to a house cat in heat. 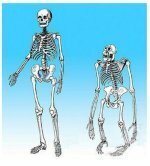 A male and female will pair up for 4 or 5 days, after which the male leaves for good. 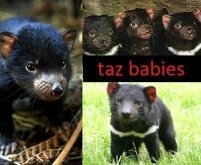 The pregnant female will find a safe den and have a small litter of 1 to 3 cubs on average. More than 3 is possible, but rare. Newborn leopard cubs are a dark grey in color, an abundance of fuzzy fur, and very faint - if any- spots. Leopards, particularly in Asia, regularly give birth to just one cub. Because of this, and because of the leopards naturally seclusive lifestyle, survival rate is actually very good for young leopards compared to some other cats. 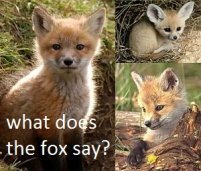 One of their most common enemies are snakes who may find little cubs alone, waiting for their mother to return from a hunt. Lions are a threat as well, and lions will kill young leopards if given a chance. Lions have also been known to actively pursue and kill adult leopards without any interest in eating them. Solitary male lions in particular seem to make almost a sport out of trying to catch both leopards and, even more often, cheetahs. There are currently 9 known subspecies of leopard in the world. 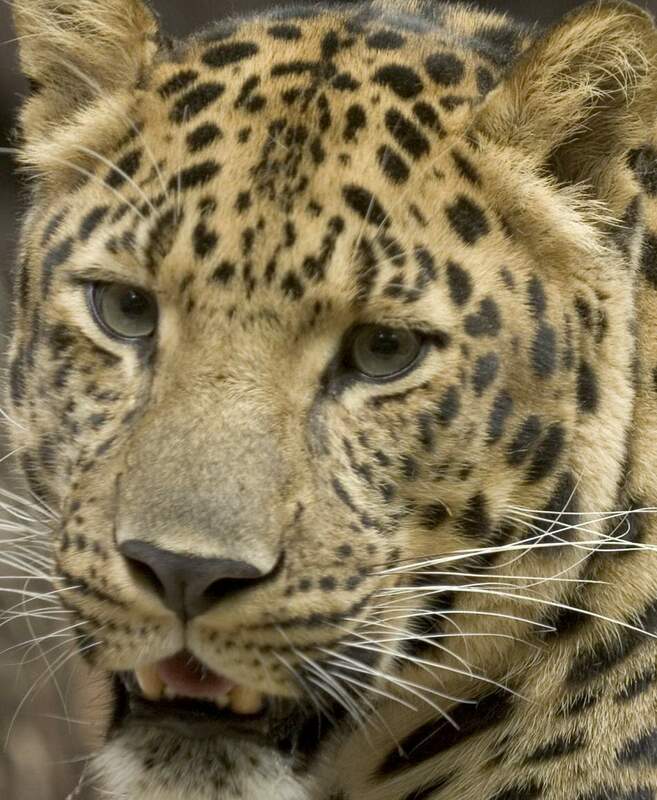 By far the most common is the African leopard which is not presently endangered. 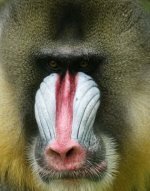 The other subspecies, spread through little pockets along Southern Asia, India, and up through the Russian far east. At the highest Northern altitudes, leopards can be found living in mountain regions where the temperatures regularly dip below freezing. 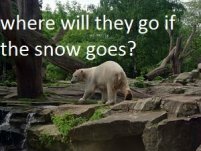 In some areas they live alongside Siberian tigers, but tend to exist along the snow line and avoid areas that get any real snow accumulations. 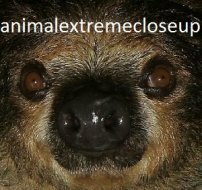 All of the Asian subspecies are endangered, and some may even be extinct to date. The exceedingly rare Amur leopard of Korea, China and East Russia is on the crest of extinction with numbers of less than 30 in the wild. 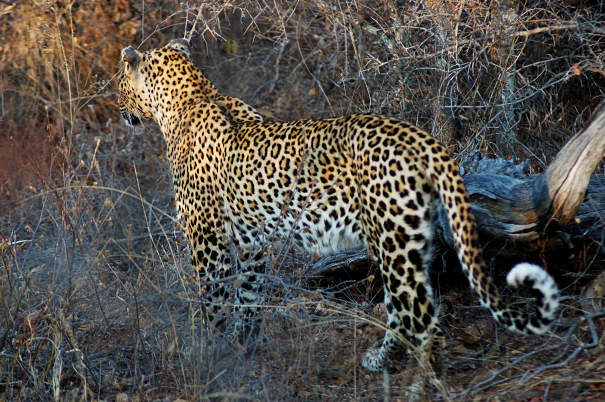 The leopards notorious stealth, however, makes it hard to determine true numbers, and the leopard, no matter where its home range may be, remains by far the most difficult big cat to record and photograph. The leopard is a very large carnivore with exceptional hardware that would give it the edge in allot of tough neighborhoods. 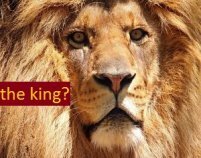 In areas of Asia where tigers are not in their range they are king of the jungle. But out on the African plains, the leopard is definitely not the apex predator. Surrounded by lions, hyenas and African wild dogs, harassed by vultures, jackals and even baboons, a hungry leopard must not only kill quickly and quietly, but also take its bounty to the trees in a hurry. 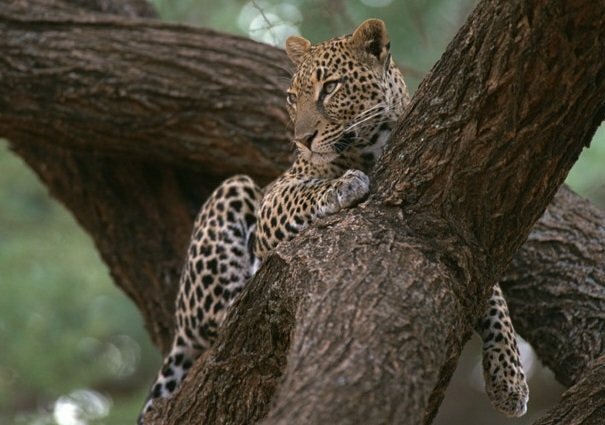 Leopards stash large kills in the crooks of branches where they can eat in peace and even leave the carcass for a few days with some confidence that heavy lions and non-climbing pests just can't reach the cache. Having the power to take down and maneuver very large prey, coupled with the agility to climb higher than the competition, works hand in hand, as a large kill does not go to waste on the floor of the savanna..
With a large kill the leopard will climb to a safe height, eat its fill, and then return for a number of days to feast on the carcass, occasionally having to fetch body parts from the ground if they become detached while it feeds. There are two cat species regularly referred to as leopards that are not closely related to the true leopard. 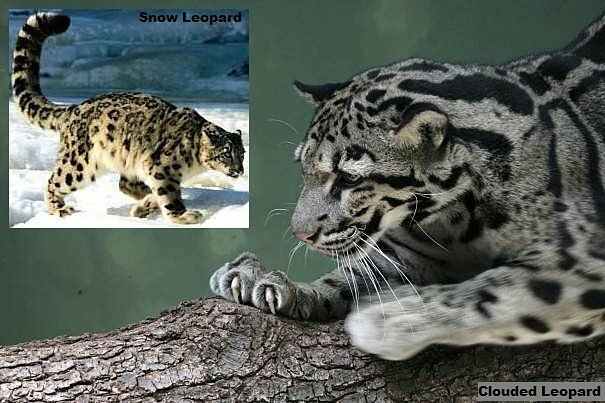 Both the snow leopard and the clouded leopard are in the subfamily pantherinae and are not big cats. There are attempts to classify the snow leopard as a member of panthera, with the belief that it is actually related to the Siberian tiger, but the snow leopard lacks the ability to roar, which has separated that genus for decades. Both the snow leopard and the smaller clouded leopard live in mountainous areas of Asia including the Himalayas. The snow leopard exists in higher altitude and is specially equipped for freezing temperatures with exceptionally thick fur and a very stocky build. The clouded leopard lives in dense forest and is rarely seen. 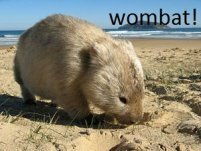 It has massive fangs and claws for its size, and a beautifully marbled coat. Both of these cats are considered an evolutionary stepping stone from smaller cats like the ocelot, to the true big cats. The leopard is the best climber of the big cats.. There are more leopards in the wild than lions, tigers and cheetahs combined. A leopards spots are really circles of spots called "rosettes" that may be round or square in shape depending on the region. 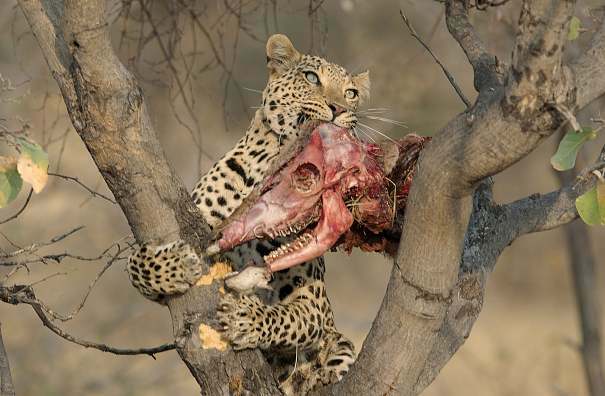 Leopards hang their kill in trees. Although they are rarely in groups, a group of leopards is called a "leap" or a "prowl"
Leopards are also known as panthers. 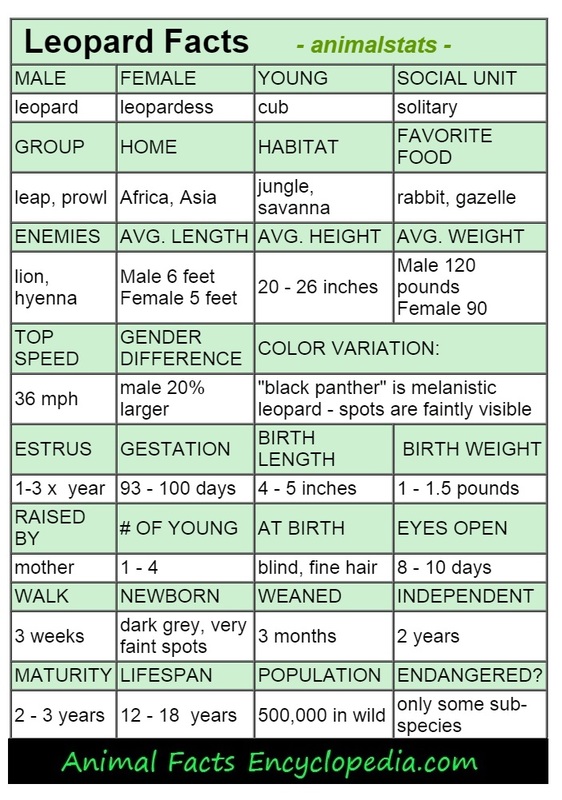 A black panther is a leopard with melanistic coat coloration.